A few months ago I came across an offer I couldn't resist. 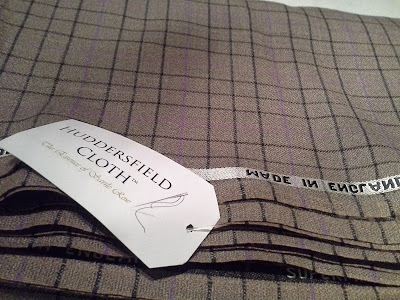 Huddersfield Cloth sold off certain fabrics at a highly reduced price and as found something I liked, I couldn't let this opportunity pass me by. I had never bought fabric before and I didn't have a clue about how much was needed to make a suit (that was, of course, what I wanted the fabric for). After searching the internet and making some enquiries, I managed to come to a conclusion. To make a three piece suit, approximately four metres should be sufficient. Thus, I went ahead and bought five metres. I wanted to be on the safe side and I'm also hoping it will be enough for a double set of trousers. If you don't know this already, here is some important advice. Always get two pairs of trousers with every suit. The trousers wear much faster than the jackets and if you don't invest in an extra pair of trousers, you will end up suits consisting of a perfectly fine jacket but with a worn out pair of trousers. This is one of the problems with buying suits off-the-peg, you very rarely get the option of buying a double set of trousers. I have many trouserless jackets hanging in the closet, from off-the-rack suits I've worn through the years. Getting back on topic, I bought some fabric a while ago which I'm hoping will be transformed into a beautiful suit. I am no expert when it comes to the qualities and production of different types of fabric but I am definitely interested in topic and I'm always trying to gather information and learn as much as possible. 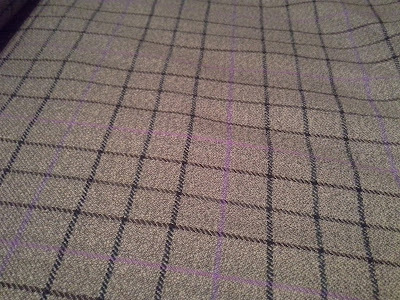 The cloth I bought is a Worsted wool fabric and I've done some research into this fabric type which I will pass on here. What characterises the Worsted is that the wool, before spinning, is combed in a carding process to remove any short and brittle fibres, a process which leaves only the longer strands of the fibre to undergo the spinning process. This produces a smooth yarn that has a high durability which can be woven into fine fabrics which are more resistant to wrinkling than many other fabrics. "Worsted fabric is woven from combed yarn. The combing process takes off the hair and draws the fibres into more or less parallel positions. The smooth appearance of the cloth which results is distinct from woollen cloth such as tweed in which the fibres are left in random position, giving it a hairy appearance." The Worsted fabric is thus, a smooth cloth ideal for garments that need to hold their shape and, not only be wrinkle free, but also hold an even crease very well. Because of these qualities, as well as the fact that it drapes well and is very durable, a Worsted fabric is, in many ways an ideal fabric for suits. It's durable qualities ensures that a suit looks new even after several dry cleanings. It also looks fresh after a long day in the office or hard night's celebrations. I have previously written about some of my tailoring experiences and the tailors I've used before is the Cad & the Dandy. I have nothing negative to say about them, but I sometimes like to try something new, so this time I've booked an appointment with Souster & Hicks. The reason I want them to make my new suit is all down to the information on their website. Having had a long look at the gallery page on their site, there is something I really like about their suits. I can't put my finger on exactly what it is but Souster & Hicks seem to have developed a distinctive style which I find very attractive. It probably has something to do with the attention to details they put on the pockets, collars and cuffs. I do like the contrast colour collars. Have a look for yourself and see what you think. One also shouldn't disregard the fact that the cost of having a suit made is within a price range I can handle. Whatever it was that made me want to try out the services of Souster & Hicks, I am really looking forward to having my new suit made. The Worsted fabric I will have my new suit made from. 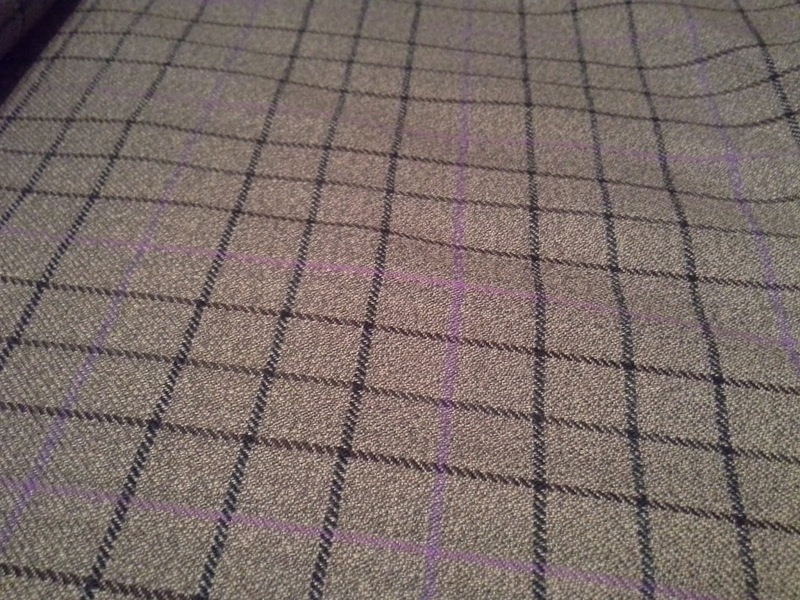 Fawn with navy, black and lilac checks. The other posts in this series: part 2, part 3, part 4.